a. Latvia is de jure continuous with its declaration of November 18, 1918. Latvia /ˈlætviə/ (Latvian: Latvija), officially the Republic of Latvia (Latvian: Latvijas Republika), is a country in the Baltic region of Northern Europe. It is bordered to the north by Estonia (border length 343 km), to the south by Lithuania (588 km), to the east by the Russian Federation (276 km), to the southeast by Belarus (141 km), and shares maritime borders to the west with Sweden. 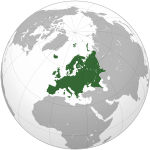 With 2,070,371 inhabitants and a territory of 64,589 km2 (24,938 sq mi) it is one of the least populous and least densely populated countries of the European Union. The capital of Latvia is Riga. The official language is Latvian and the currency is called Lats (Ls). The country has a temperate seasonal climate. The Latvians are a Baltic people, culturally related to the Lithuanians. Together with the Finnic Livs (or Livonians), the Latvians are the indigenous people of Latvia. Latvian is an Indo-European language and along with Lithuanian the only two surviving members of the Baltic branch. Indigenous minority languages are Latgalian and the nearly extinct Finnic Livonian language. In terms of geography, territory and population Latvia is the middle of three Baltic states: Estonia, Latvia and Lithuania. Latvia and Estonia share a long common history: historical Livonia, times of Polish-Lithuanian, German (Teutonic Order), Swedish, Russian, Nazi German and Soviet rule, 13th century Christianization and 16th century Protestant Reformation. Both countries are home to a large number of ethnic Russians (26.9% in Latvia and 25.5% in Estonia) of whom some are non-citizens. Latvia is historically predominantly Protestant, except for the region of Latgalia in the southeast which has historically been predominantly Roman Catholic. Latvia is a unitary parliamentary republic and is divided into 118 administrative divisions of which 109 are municipalities and 9 are cities. There are five planning regions: Courland (Kurzeme), Latgalia (Latgale), Riga (Rīga), Vidzeme and Zemgale. The Republic of Latvia was founded on November 18, 1918. It was occupied and annexed by the Soviet Union between 1940–1941 and 1945–1991 and by Nazi Germany between 1941–1945. The peaceful "Singing Revolution" between 1987 and 1991 and "Baltic Way" demonstration on August 23, 1989 led to the independence of the Baltic states. Latvia declared the restoration of its de facto independence on August 21, 1991. Latvia is a member of the United Nations, European Union, Council of Europe, NATO, Organization for Security and Co-operation in Europe, International Monetary Fund and World Trade Organization, and is part of the Schengen Area. It was a member of the League of Nations (1921–1946) and the Baltic Free Trade Area (1994–2004). Latvia is also a member of the Council of the Baltic Sea States and Nordic Investment Bank, and is together with Estonia and Lithuania involved in trilateral Baltic States cooperation and Nordic-Baltic cooperation. After economic stagnation in the early 1990s, Latvia posted Europe-leading GDP growth figures during 1998–2006. In the global financial crisis of 2008–2010 Latvia was the hardest hit of the European Union member states, with a GDP decline of 26.54% in that period. Commentators noted signs of stabilisation in the Latvian economy by 2010, and the state of the economy continued to improve, as Latvia once again became one of the fastest growing economies of the EU in 2011. The United Nations lists Latvia as a country with a "Very High" Human Development Index (HDI). The name Latvija is derived from the name of the ancient Latgalians, one of four Indo-European Baltic tribes (along with Couronians, Selonians and Semigallians) that are the forebears of today's Latvians. 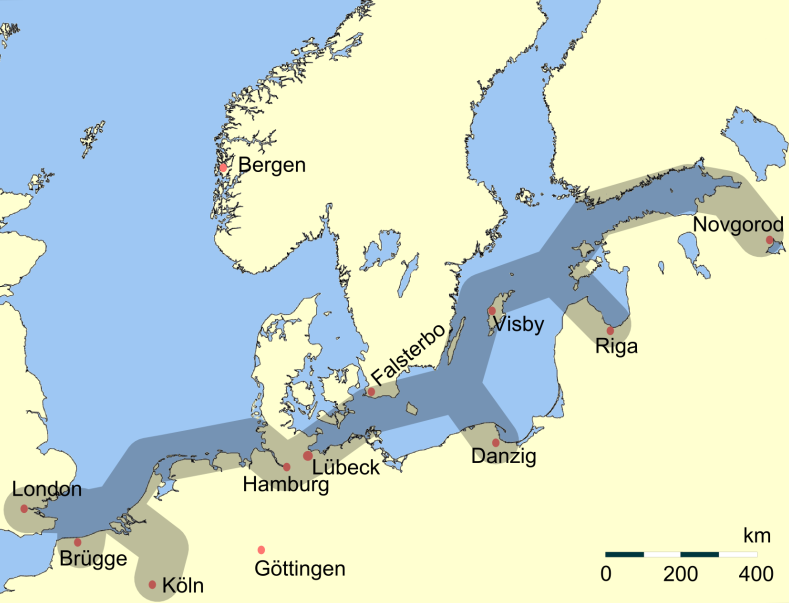 Around the beginning of the third millennium BC (3000 BC), the proto-Baltic ancestors of the Latvian people settled on the eastern coast of the Baltic Sea. The Balts established trade routes to Rome and Byzantium, trading local amber for precious metals. By 900 AD, four distinct Baltic tribes inhabited Latvia: Curonians, Latgalians, Selonians, Semigallians (in Latvian: kurši, latgaļi, sēļi and zemgaļi), as well as the Livonians (lībieši) speaking a Finnic language. Although the local people had had contact with the outside world for centuries, they were more fully integrated into European society in the 12th century. The first missionaries, sent by the Pope, sailed up the Daugava River in the late 12th century, seeking converts. The local people, however, did not convert to Christianity as readily as hoped. German crusaders were sent into Latvia to convert the pagan population by force of arms. The Capitulation of Estonia and Livonia in 1710 and the Treaty of Nystad, ending the Great Northern War in 1721, gave Vidzeme to Russia (it became part of the Riga Governorate). The Latgale region remained part of the Polish–Lithuanian Commonwealth as Inflanty Voivodeship until 1772, when it was incorporated into Russia. The Duchy of Courland and Semigallia became an autonomous Russian province (the Courland Governorate) in 1795, bringing all of what is now Latvia into the Russian Empire. All three Baltic provinces preserved local laws, the local official language and their own parliament, the Landtag. During the Great Northern War (1700–1721), the Baltic area was once again the scene of great devastation, with Peter the Great's scorched-earth policy, famine, and Great Plague of Riga being responsible for catastrophic loss of human life: as much as 40% of the population in Latvian lands were killed. In 1710, the plague reached Riga, where it was active until 1711 and claimed the lives of about half the population. The promises Peter the Great made to the Baltic German nobility at the fall of Riga in 1710, confirmed by the Treaty of Nystad and known as "the Capitulations", largely reversed the Swedish reforms. 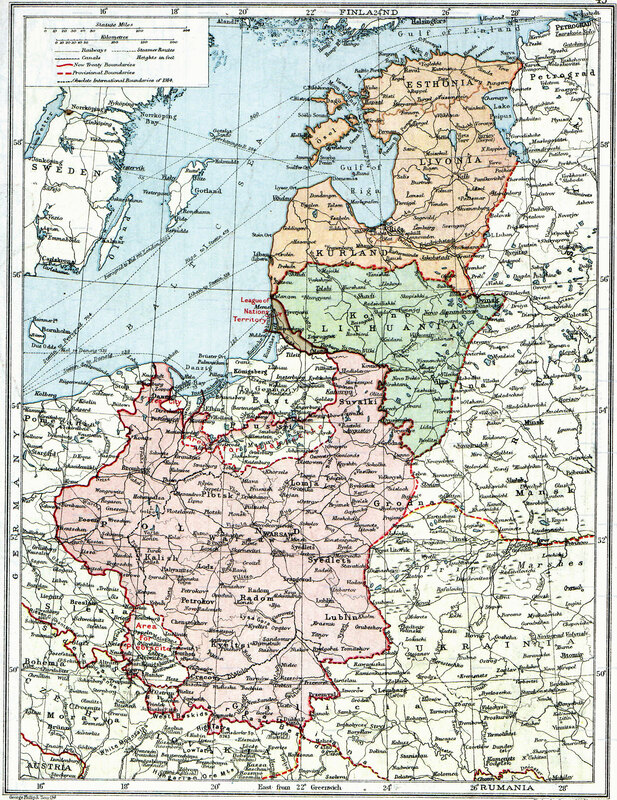 “Poland & The New Baltic States” map from a British atlas in 1920, showing still-undefined borders after the treaties of Brest and Versailles and before the Peace of Riga. World War I devastated the territory of what would become the state of Latvia, along with other western parts of the Russian Empire. Demands for self-determination were at first confined to autonomy, but the Russian 1917 Revolution, treaty with Germany at Brest-Litovsk, and allied armistice with Germany on November 11, 1918, created a power vacuum. The People's Council of Latvia proclaimed the independence of the new country in Riga on November 18, 1918, with Kārlis Ulmanis becoming the head of the provisional government. The War of Independence that followed was part of a general chaotic period of civil and new border wars in Eastern Europe. By the spring of 1919, there were actually three governments — Ulmanis' government; the Latvian Soviet government led by Pēteris Stučka, whose forces, supported by the Red Army, occupied almost all of the country; and the Baltic German government of the United Baltic Duchy, headed by Andrievs Niedra and supported by the Baltische Landeswehr and the German Freikorps unit Iron Division. Estonian and Latvian forces defeated the Germans at the Battle of Wenden in June 1919, and a massive attack by a predominantly German force — the West Russian Volunteer Army — under Pavel Bermondt-Avalov was repelled in November. Eastern Latvia was cleared of Red Army forces by Latvian and Polish troops in early 1920 (from the Polish perspective the Battle of Daugavpils was a part of the Polish-Soviet War). A freely elected Constituent assembly convened on May 1, 1920, and adopted a liberal constitution, the Satversme, in February 1922. 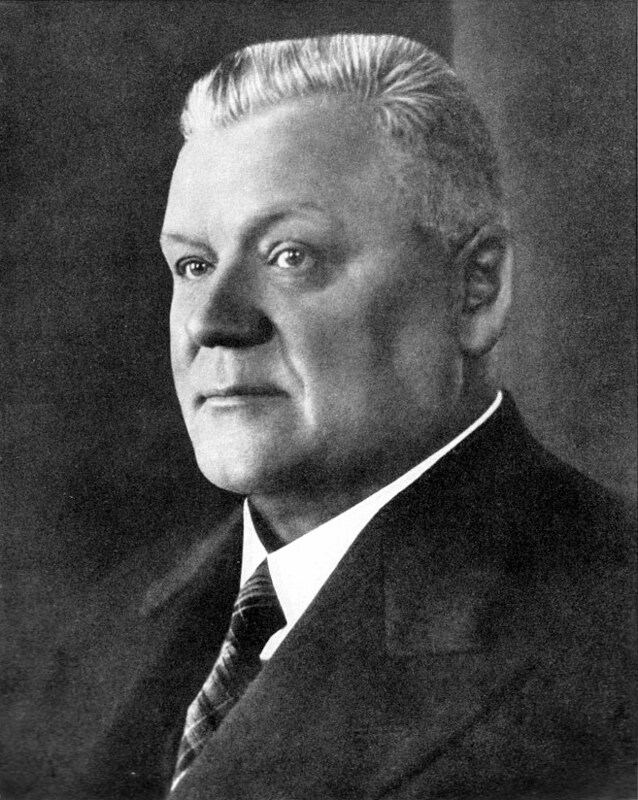 The constitution was partly suspended by Kārlis Ulmanis after his coup in 1934, but reaffirmed in 1990. Since then, it has been amended and is still in effect in Latvia today. With most of Latvia's industrial base evacuated to the interior of Russia in 1915, radical land reform was the central political question for the young state. In 1897, 61.2% of the rural population had been landless; by 1936, that percentage had been reduced to 18%. By 1923, the extent of cultivated land surpassed the pre-war level. Innovation and rising productivity led to rapid growth of the economy, but it soon suffered from the effects of the Great Depression. Latvia showed signs of economic recovery and the electorate had steadily moved toward the centre during the parliamentary period. On May 15, 1934, Ulmanis staged a bloodless coup, establishing a nationalist dictatorship that lasted until 1940. After 1934, Ulmanis established government corporations to buy up private firms with the aim of "Latvianising" the economy. "TWO WORLDS": Anti-Sovietism propaganda board, Latvia, Summer, 1941. Early in the morning of August 24, 1939, the Soviet Union and Nazi Germany signed a 10-year non-aggression pact, called the Molotov–Ribbentrop Pact. The pact contained a secret protocol, revealed only after Germany's defeat in 1945, according to which the states of Northern and Eastern Europe were divided into German and Soviet "spheres of influence". In the North, Latvia, Finland and Estonia were assigned to the Soviet sphere. Thereafter, Germany and the Soviet union invaded their respective portions of Poland. After the conclusion of the Molotov-Ribbentrop Pact, most of the Baltic Germans left Latvia by agreement between Ulmanis' government and Nazi Germany under the Heim ins Reich program. In total 50,000 Baltic Germans left by the deadline of December 1939, with 1,600 remaining to conclude business and 13,000 choosing to remain in Latvia. Most of those who remained left for Germany in summer 1940, when a second resettlement scheme was agreed. On 5 October 1939, Latvia was forced to accept a "mutual assistance" pact with the Soviet Union, granting the Soviets the right to station between 25,000 and 30,000 troops on Latvian territory. After staging border incidents, on 16 June 1940 the government of the USSR handed the Latvian ambassador in Moscow a note, in which Latvia was accused of breaching the articles of the agreement of 5 October 1939, and demands were made for sending in additional Soviet troops and to change the government. The Latvian government capitulated in the face of overwhelming force. On 17 June Soviet troops invaded Latvian territory. In his address by radio, Kārlis Ulmanis, announced: “Soviet forces are marching into our land this very morning. This is happening with the knowledge and consent of the government, which in turn stems from the amicable relations that exist between Latvia and the Soviet Union. It is, therefore, my wish that the residents of our country also show friendship towards the advancing military units ... The government has resigned. I shall remain in my place, you remain in yours”. No opposition was shown towards the Soviet forces; on the contrary, part of the population accepted the news of their arrival with enthusiasm, which was heavily exploited by Soviet propaganda. Observing them, the well known Russian lawyer and public figure of Latvia, Pyotr Yakobi, wrote: “Taken from the German model, the authoritarian beginning in our country has turned into a government of national bureaucracy, having satisfied a limited circle of citizens, who have adapted themselves to the state pie. Clearly, any hardship is not in vain. And so now the down-trodden have raised their voice and demand a return of their rights that have been trampled on ... “. Among those unhappy with the regime of Kārlis Ulmanis were not only the national minorities but also many Latvians who were anxious about the deteriorating economic situation and who had no desire to end up under the rule of Nazi Germany. The mass killings of 2,749 Jews on the beach near the city of Liepāja, December 1941. State administrators were liquidated and replaced by Soviet cadres, in which 34,250 Latvians were deported or killed. Elections were held with single pro-Soviet candidates listed for many positions; the resulting people's assembly immediately requested admission into the USSR, which was granted by the Soviet Union. Latvia, then a puppet government, was headed by Augusts Kirhenšteins. Latvia was incorporated into the Soviet Union on August 5, 1940 as The Latvian Soviet Socialist Republic. The Soviets dealt harshly with their opponents – prior to the German invasion, in the course of less than a year, at least 27,586 persons were arrested; most were deported for cooperation with the German army, and about 945 persons were shot. While under German occupation, Latvia was administered as part of Reichskommissariat Ostland. Latvian paramilitary and Auxiliary Police units established by the occupation authority participated in the Holocaust as well. More than 200,000 Latvian citizens died during World War II, including approximately 75,000 Latvian Jews murdered during the Nazi occupation. Latvian soldiers fought on both sides of the conflict, including in the Latvian Legion of the Waffen-SS, most of them conscripted by the occupying Nazi and Soviet authorities. In 1944 when the Soviet military advances reached the area heavy fighting took place in Latvia between German and Soviet troops which ended with another German defeat. During the course of the war, both occupying forces conscripted Latvians into their armies, in this way increasing the loss of the nation's "live resources". In 1944, part of the Latvian territory once more came under Soviet control. The Soviets immediately began to reinstate the Soviet system. After the German surrender it became clear that Soviet forces were there to stay, and Latvian national partisans, soon to be joined by German collaborators, began their fight against another occupier – the Soviet Union. On March 25, 1949, 43,000 rural residents ("kulaks") and Latvian patriots ("nationalists") were deported to Siberia in a sweeping Operation Priboi in all three Baltic states, which was carefully planned and approved in Moscow already on January 29, 1949. Between 136,000 and 190,000 Latvians, depending on the sources, were imprisoned, repressed or deported to Soviet concentration camps (the Gulag) in the post war years, from 1945 to 1952. Some managed to escape arrest and joined the partisans. In the post-war period, Latvia was driven to adopt Soviet farming methods. Rural areas were forced into collectivisation. An extensive programme to impose bilingualism was initiated in Latvia, limiting the use of Latvian language in official uses in favor of using Russian as the main language. All of the minority schools (Jewish, Polish, Belorussian, Estonian, Lithuanian) were closed down leaving only two media of instructions in the schools: Latvian and Russian. An influx of labourers, administrators, military personnel and their dependents from Russia and other Soviet republics started. By 1959 about 400,000 persons arrived from other Soviet republics and the ethnic Latvian population had fallen to 62%. Because Latvia had still maintained a well-developed infrastructure and educated specialists it was decided in Moscow that some of the Soviet Union's most advanced manufacturing factories were to be based in Latvia. New industry was created in Latvia, including a major machinery factory RAF in Jelgava, electrotechnical factories in Riga, chemical factories in Daugavpils, Valmiera and Olaine, as well as some food and oil processing plants. However, there were not enough people to operate the newly built factories. In order to expand industrial production, skilled workers were transferred into the republic from all over the Soviet Union, decreasing the proportion of ethnic Latvians in the republic. In the second half of 1980s Soviet leader Mikhail Gorbachev started to introduce political and economic reforms in the Soviet Union, called glasnost and Perestroika. In the summer of 1987 the first large demonstrations were held in Riga at the Freedom Monument- a symbol of independence. In the summer of 1988 a national movement, coalescing in the Popular Front of Latvia, was opposed by the Interfront. The Latvian SSR, along with the other Baltic Republics was allowed greater autonomy, and in 1988 the old pre-war Flag of Latvia was allowed to be used, replacing the Soviet Latvian flag as the official flag in 1990. In 1989, the Supreme Soviet of the USSR adopted a resolution on the "Occupation of the Baltic states", in which it declared that the occupation was "not in accordance with law," and not the "will of the Soviet people". Pro-independence Popular Front of Latvia candidates gained a two-thirds majority in the Supreme Council in the March 1990 democratic elections. On May 4, 1990, the Supreme Soviet of the Latvian SSR adopted the Declaration On the Restoration of Independence of the Republic of Latvia and the Latvian SSR was renamed Republic of Latvia. However, the central power in Moscow continued to regard Latvia as Soviet republic in 1990–1991. In January 1991, Soviet political and military forces tried unsuccessfully to overthrow the Republic of Latvia authorities by occupying the central publishing house in Riga and establishing a Committee of National Salvation to usurp governmental functions. During the transitional period Moscow maintained many central Soviet state authorities in Latvia. In spite of this, 73% of all Latvian residents confirmed their strong support for independence on March 3, 1991, in a nonbinding advisory referendum. A large number of ethnic Russians also voted for the proposition. The Popular Front of Latvia had advocated that all permanent residents be eligible for Latvian citizenship. However, universal citizenship for all permanent residents was not adopted subsequently; a majority of ethnical non-Latvians did not receive Latvian citizenship even though they had voted in support of independence. Many of them were born in Latvia, but still became non-citizens. Until 2011 more than half of non-citizens have gone through the process of naturalization exams and received Latvian citizenship. Still today there are 290,660 non-citizens of Latvia, which represent 14.1% of population. Those people have no citizenship of any country and cannot vote in Latvia. The Republic of Latvia declared the end of the transitional period and restored full independence on August 21, 1991 in the aftermath of the failed Soviet coup attempt. The Saeima, Latvia's parliament, was again elected in 1993, and Russia completed its military withdrawal in 1994. The major goals of Latvia in the 1990s, to join NATO and the European Union, were achieved in 2004. Language and citizenship laws have been opposed by many Russophones. (Citizenship was not automatically extended to former Soviet citizens who settled during the Soviet occupation or to their subsequent offspring. This resulted in a situation where people who have lived and worked in Latvia for over 50 years were nonetheless unable to vote, which meant that Russian voice was largely excluded from the parliament and the government. Children born to non-nationals after the reestablishment of independence are automatically entitled to citizenship.) Approximately 72% of Latvian citizens are Latvian, while 20% are Russian; less than 1% of non-citizens are Latvian, while 71% are Russian. The government denationalised private property confiscated by the Soviet rule, returning it or compensating the owners for it, and privatised most state-owned industries, reintroducing the prewar currency. Albeit having experienced a difficult transition to a liberal economy and its re-orientation toward Western Europe, its economy had one of the highest growth rates until the 2008–2010 Latvian financial crisis. Most of Latvia's territory is less than 100 m (330 ft) above sea level. Its largest lake Lubāns is 80.7 km2 (31.2 sq mi), its deepest lake Drīdzis is 65.1 m (214 ft). The longest river on Latvian territory is the Gauja, 452 km (281 mi). The longest river flowing through Latvian territory is the Daugava, which has a total length 1,005 km (624 mi) of which 352 m (1,155 ft) on Latvian territory. Latvia's highest point is Gaiziņkalns, 311.6 m (1,022 ft). The length of Latvia's Baltic coastline is 494 km (307 mi). An inlet of the Baltic Sea, the shallow Gulf of Riga is situated in the northwest of the country. Most of the country is composed of fertile lowland plains and moderate hills. A typical Latvian landscape is a mosaic of vast forests alternating with fields, farmsteads, and pastures; amid arable land are birch groves and wooded clusters, which afford a habitat for numerous plants and animals. Latvia has hundreds of kilometres of undeveloped seashore lined by pine forests, dunes, and continuous white sand beaches. Latvia has the 4th highest proportion of land covered by forests in the European Union, after Finland, Sweden and Slovenia. Forests account for 3,497,000 ha (8,600,000 acres) or 56% of the total land area. Latvia has over 12,500 rivers that stretch for 38,000 km (24,000 mi). Major rivers include the Daugava River, Lielupe, Gauja, Venta, and Salaca, the largest spawning ground for salmon in the eastern Baltics. There are 2,256 lakes that are bigger than 1 ha (2.5 acres), with a collective area of 1,000 km2 (390 sq mi). Mires occupy 9.9% of Latvia's territory. Of these, 42% are raised bogs; 49% are fens; and 9% are transitional mires. 70% percent of the mires are untouched by civilisation, and they are a refuge for many rare species of plants and animals. Utilised agricultural areas account for 1,815,900 ha (4,490,000 acres) or 29% of the total land area. With the dismantling of collective farms, the area devoted to farming decreased dramatically – now farms are predominantly small. Approximately 200 farms, occupying 2,750 ha (6,800 acres), are engaged in ecologically pure farming (i.e., using no artificial fertilisers or pesticides). Latvia has a long tradition of conservation: the first laws and regulations were promulgated in the 16th and 17th centuries. There are 706 specially state-level protected natural areas in Latvia, of which: 4 national parks, 1 biosphere reserve, 42 nature parks, 9 areas of protected landscapes, 260 nature reserves, 4 strict nature reserves, 355 nature monuments, 7 protected marine areas and 24 microreserves. Nationally protected areas account for 12,790 km2 (4,940 sq mi) or around 20% of Latvia's total land area. Latvia's Red Book (Endangered Species List of Latvia), which was established in 1977, contains 112 plant species and 119 animal species. Latvia has ratified the international Washington, Bern, and Ramsare conventions. Latvia is a member of the United Nations, European Union, Council of Europe, NATO, Organization for Security and Co-operation in Europe, International Monetary Fund and World Trade Organization. It was a member of the League of Nations (1921–1946). Latvia is also a member of the Council of the Baltic Sea States and Nordic Investment Bank. Latvia has established diplomatic relations with 158 countries and maintains embassies in 35 countries. 37 countries maintain an embassy in Latvia's capital Riga. Latvia hosts one European Union institution, the Body of European Regulators for Electronic Communications (BEREC). Latvia’s foreign policy priorities include co-operation in the Baltic Sea region, European integration, active involvement in international organisations, contribution to European and transatlantic security and defence structures, participation in international civilian and military peacekeeping operations, and development co-operation, particularly the strengthening of stability and democracy in the EU's Eastern neighbours. Since the early 1990s, Latvia is involved in active trilateral Baltic states co-operation with its neighbours Estonia and Lithuania, and Nordic-Baltic co-operation with the Nordic countries. The Baltic Council is the joint forum of the interparliamentary Baltic Assembly (BA) and the intergovernmental Baltic Council of Ministers (BCM). Nordic-Baltic Eight (NB-8) is the joint co-operation of the governments of Denmark, Estonia, Finland, Iceland, Latvia, Lithuania, Norway and Sweden. Nordic-Baltic Six (NB-6), comprising Nordic-Baltic countries that are European Union member states, is a framework for meetings on EU related issues. Interparliamentary co-operation between the Baltic Assembly and Nordic Council was signed in 1992 and since 2006 annual meetings are held as well as regular meetings on other levels. Joint Nordic-Baltic projects include the education programme Nordplus. The Enhanced Partnership in Northern Europe or e-Pine is the U.S. Department of State diplomatic framework for co-operation with the Nordic-Baltic countries. In 2013 Riga will host the annual Northern Future Forum, a two day informal meeting of the prime ministers of the Nordic-Baltic countries and the UK. The Northern Dimension and Baltic Sea Region Programme are European Union initiatives for cross-border co-operation in the Baltic Sea region and Northern Europe. Human rights in Latvia are generally respected by the government, according to Freedom House and US Department of State. Latvia is ranked above-average among the world's sovereign states in democracy, press freedom, privacy  and human development. The country has a large ethnic Russian community, which was guaranteed basic rights under the constitution and international human rights laws ratified by the Latvian government. However, human rights organisations have reported multiple problems. Non-citizens – including stateless persons – have limited access to some political rights – only citizens are allowed to participate in parliamentary or municipal elections, although there are no limitations in regards to joining political parties or other political organizations. Also there were problems with police abuse of detainees and arrestees, poor prison conditions and overcrowding, judicial corruption, discrimination against women, incidents of violence against ethnic minorities, and societal violence and incidents of government discrimination against homosexuals. The National Armed Forces (Latvian: Nacionālie Bruņotie Spēki (NAF)) of Latvia consists of the Land Forces, Naval Forces, Air Force, National Guard, Special Tasks Unit, Military Police, NAF Staff Battalion, Training and Doctrine Command and Logistics Command. Latvia's defence concept is based upon the Swedish-Finnish model of a rapid response force composed of a mobilization base and a small group of career professionals. From January 1, 2007 Latvia has switched to a professional fully contract-based army. Latvia participates in international peacekeeping and security operations. Latvian armed forces have contributed to NATO and EU military operations in Bosnia and Herzegovina (1996–2009), Albania (1999), Kosovo (2000–2009), Macedonia (2003), Iraq (2005–2006), Afghanistan (since 2003) and Somalia (since 2011). Latvia also took part in the US-led Multi-National Force operation in Iraq (2003–2008) and OSCE missions in Georgia, Kosovo and Macedonia. Latvian armed forces will contribute to a UK-led Battlegroup in 2013 and the Nordic Battlegroup in 2015 under the Common Security and Defence Policy (CSDP) of the European Union. Latvia acts as the lead nation in the coordination of the Northern Distribution Network for transportation of non-lethal ISAF cargo by air and rail to Afghanistan. It is part of the Nordic Transition Support Unit (NTSU), which renders joint force contributions in support of Afghan security structures ahead of the withdrawal of Nordic and Baltic ISAF forces in 2014. Since 1996 more than 3600 military personnel have participated in international operations, of whom 7 soldiers perished. Per capita, Latvia is one of the largest contributors to international military operations. Since March 2004, when the Baltic states joined NATO, fighter jets of NATO members are on rotational basis deployed for the Baltic Air Policing mission at Šiauliai Airport in Lithuania to guard the Baltic airspace. Latvia is a founding member of the NATO Cooperative Cyber Defence Centre of Excellence in Tallinn, Estonia and the NATO Energy Security Centre of Excellence in Vilnius, Lithuania. Since the year 2000 Latvia has had one of the highest (GDP) growth rates in Europe. However, the chiefly consumption-driven growth in Latvia resulted in the collapse of the Latvian GDP in late 2008 and early 2009, exacerbated by the global economic crisis and shortage of credit. Latvian economy fell 18% in the first three months of 2009, the biggest fall in the European Union. According to Eurostat data, Latvian PPS GDP per capita stood at 56 per cent of the EU average in 2008. This latest scenario has proven the earlier assumptions that the fast growing economy was heading for implosion of the economic bubble, because it was driven mainly by growth of domestic consumption, financed by a serious increase of private debt, as well as a negative foreign trade balance. The prices of real estate, which were at some points appreciating at approximately 5% a month, were long perceived to be too high for the economy, which mainly produces low-value goods and raw materials. Latvia plans to introduce the Euro as the country's currency but, due to the inflation being above EMU's guidelines, the government's official target is now January 1, 2014. 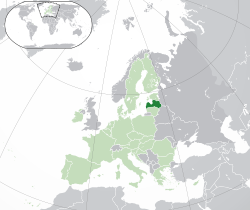 Latvia is part of the Schengen Area and the EU single market. Privatization in Latvia is almost complete. Virtually all of the previously state-owned small and medium companies have been privatized, leaving only a small number of politically sensitive large state companies. The private sector accounted for nearly 68% of the country's GDP in 2000. Foreign investment in Latvia is still modest compared with the levels in north-central Europe. A law expanding the scope for selling land, including to foreigners, was passed in 1997. Representing 10.2% of Latvia's total foreign direct investment, American companies invested $127 million in 1999. In the same year, the United States exported $58.2 million of goods and services to Latvia and imported $87.9 million. Eager to join Western economic institutions like the World Trade Organization, OECD, and the European Union, Latvia signed a Europe Agreement with the EU in 1995—with a 4-year transition period. Latvia and the United States have signed treaties on investment, trade, and intellectual property protection and avoidance of double taxation. Latvia's unemployment rate rose sharply in this period from a low of 5.4% in November 2007 to over 22%. In April 2010 Latvia had the highest unemployment rate in the EU, at 22.5%, ahead of Spain which had 19.7%. The IMF concluded the First Post-Program Monitoring Discussions with the Republic of Latvia in July 2012 announcing that Latvia’s economy has been recovering strongly since 2010, following the deep downturn in 2008–09. Real GDP growth of 5.5 percent in 2011 was underpinned by export growth and a recovery in domestic demand. The growth momentum has continued into 2012 despite deteriorating external conditions, and the economy is expected to expand by 3.5 percent. The unemployment rate has receded from its peak of more than 20 percent in 2010, but remains high at more than 16 percent in 2012. The transport sector is around 14% of GDP. Transit between Russia and the West is large. Key ports are in Riga, Ventspils, and Liepāja. Most transit traffic uses these and half the cargo is crude oil and oil products. Riga International Airport is the busiest airport in the Baltic States with 5.1 million passengers in 2011. AirBaltic is the Latvian flag carrier airline and a low-cost carrier. Latvia has 3 big hydroelectric power stations (Pļaviņu HES (825MW), Rīgas HES (402 MW), Ķeguma HES-2 (192 MW). Population of Latvia (in millions) from 1950–2012. As of March 2011, Latvians and Livonians (about 400 people), the indigenous peoples of Latvia, form about 62.1% of the population, while 26.9% are Russians, Belarusians 3.3%, Ukrainians 2.2%, Poles 2.2%, Lithuanians 1.2%, Jews 0.3%, Roma people 0.3%, Germans 0.1%, Estonians 0.1% and others 1.3%. There were 290,660 non-citizens living in Latvia or 14.1% of Latvian residents, mainly ethnic Russians who arrived after the occupation of 1940 and their descendants. The sole official language of Latvia is Latvian, which belongs to the Baltic language group of the Indo-European language family. Another notable language of Latvia is the nearly extinct Livonian language of the Finnic branch of the Uralic language family, which enjoys protection by law; Latgalian — referred as either dialect or distinct separate language of Latvian — is also formally protected by Latvian law but only as a historical variation of the Latvian language. Russian, which was widely spoken during the Soviet period, is still the most widely used minority language by far (about 30% speak it natively), and it is understood by virtually all Latvians who started their education during the period of Soviet rule. Despite this, the Russian language is not protected by Latvian law. While it is now required that all school students learn Latvian, most schools also include English and either German or Russian in their curricula. The English language is widely accepted in Latvia especially in business and tourism. On February 18, 2012 Latvia held a constitutional referendum on whether to adopt Russian as a second official language. According to the Central Election Commission, 74,8% voted against, 24.88% voted for and the voter turnout was 71.11%. However, a large part of Latvia's Russian speaking community (290,660 or 14.1% of Latvia's entire population) could not vote in this referendum because they hold non-citizen status and thus have no right to vote. In the Eurobarometer Poll 2005, 37% of Latvian citizens responded that "they believe there is a god", while 49% answered that "they believe there is some sort of spirit or life force" and 10% stated that "they do not believe there is any sort of spirit, god, or life force". Lutheranism was more prominent before the Soviet occupation, when it was a majority religion due to strong historical links with the Nordic countries and Northern Germany. Since then, Lutheranism has declined to a slightly greater extent than Roman Catholicism in all three Baltic states. The Evangelical Lutheran Church, with an estimated 600,000 members in 1956, was affected most adversely. An internal document of March 18, 1987, near the end of communist rule, spoke of an active membership that had shrunk to only 25,000 in Latvia, but the faith has since experienced a revival. The country's Orthodox Christians belong to the Latvian Orthodox Church, a semi-autonomous body within the Russian Orthodox Church. In 2011, there were 416 Jews and 319 Muslims living in Latvia. There are more than 600 Latvian neopagans, Dievturi (The Godskeepers), whose religion is based on Latvian mythology. About 40% of the total population is not affiliated with a specific religion. Riga Technical University and University of Latvia are two major universities in the country, both been established on the basis of Riga Polytechnical Institute and located in Riga. Another two important universities, which were established on the base of State University of Latvia, are Latvia University of Agriculture (established in 1939 on the basis of the Faculty of Agriculture) and Riga Stradiņš University (established in 1950 on the basis of the Faculty of Medicine) – both nowadays cover a variety of different fields. Daugavpils University is another significant center of education. Latvia closed 131 schools between 2006 and 2010, which is a 12.9% decline, and in the same period enrollment in educational institutions has fallen by over 54,000 people, a 10.3% decline. The Latvian healthcare system is a universal program, largely funded through government taxation. It is among the lowest-ranked healthcare systems in Europe, due to excessive waiting times for treatment, insufficient access to the latest medicines, and other factors. There were 59 hospitals in Latvia in 2009, down from 94 in 2007, and 121 in 2006. The average life expectancy at birth is 72.7 years, second lowest in the European Union. As of 2009, there were approximately 8,600 inhabitants of Latvia living with HIV/AIDS, accounting for a .7% adult HIV prevalence rate. There were 32,376 (1.44%) individual instances of clinically reported alcoholism in Latvia in 2008, as well as cases of addictions to other substances. The annual number of births per 1,000 adolescent women aged 15 to 19 has declined from 49.9 in 1990 to 17.9 in 2007. In 2005, Latvia had a suicide rate of 24.5 per 100,000 inhabitants (down from 40.7 in 1995), the 7th highest in the world. Between the 13th and 19th century, Baltic Germans, many of whom were originally of non-German ancestry but had been assimilated into German culture, formed the upper class. They developed distinct cultural heritage, characterised by both Latvian and German influences. It has survived in German Baltic families to this day, in spite of their dispersal to Germany, the USA, Canada and other countries in the early 20th century. However, most indigenous Latvians did not participate in this particular cultural life. Thus, the mostly peasant local pagan heritage was preserved, partly merging with Christian traditions, for example in one of the most popular celebrations today which is Jāņi, a pagan celebration of the summer solstice, celebrated on the feast day of St. John the Baptist. In the 19th century Latvian nationalist movements emerged promoting Latvian culture and encouraging Latvians to take part in cultural activities. The 19th century and beginning of the 20th century is often regarded as a classical era of Latvian culture. Posters show the influence of other European cultures, for example, works of artists such as the Baltic-German artist Bernhard Borchert and the French Raoul Dufy. With the onset of World War II, many Latvian artists and other members of the cultural elite fled the country yet continued to produce their work, largely for a Latvian émigré audience. After incorporation into the Soviet Union, Latvian artists and writers were forced to follow the Socialist realism style of art. During the Soviet era, music became increasingly popular, with the most popular being songs from the 1980s. At this time, songs often made fun of the characteristics of Soviet life and were concerned about preserving Latvian identity. This aroused popular protests against the USSR and also gave rise to an increasing popularity of poetry. Since independence, theatre, scenography, choir music and classical music have become the most notable branches of Latvian culture. Caraway cheese is traditionally served on the Latvian festival Jāņi. Ice hockey is the most popular sport. Latvia has many famous hockey stars like Helmut Balderis, Artūrs Irbe, Kārlis Skrastiņš, Sandis Ozoliņš. The most famous and most supported Latvian ice hockey club is Dinamo Riga. The 2006 IIHF World Championship was held in Latvia. Second most popular sport is basketball. At the moment the best known Latvian player is Andris Biedriņš who plays in NBA. Other popular sports include volleyball, floorball, football, tennis, cycling and bobsleigh. The Latvia national football team participated in 2004 UEFA Euro for the first time. Latvia has participated successfully in Winter and Summer Olympics. ^ a b Veģis, Pēteris. "On key provisional results of Population and Housing Census 2011". Population and Housing Census 2011. Social Statistics Department of Latvia. http://www.csb.gov.lv/en/notikumi/key-provisional-results-population-and-housing-census-2011-33306.html. Retrieved 19 January 2012. ^ a b "Etniskais sastāvs un mazākumtautību kultūras identitātes veicināšana". Latvijas Republikas Ārlietu Ministrija. http://web.archive.org/web/20110712232935/http://www.mfa.gov.lv/lv/latvia/integracija/integracijas-politika/kultura/. Retrieved 2 December 2011. ^ a b "History – Embassy of Finland, Riga". Embassy of Finland, Riga. 2008-07-09. http://www.finland.lv/public/default.aspx?nodeid=38439&contentlan=2&culture=en-US. Retrieved 2010-09-02. "Latvia declared independence on 21 August 1991...The decision to restore diplomatic relations took effect on 29 August 1991"
^ a b "Population Census 2011 – Key Indicators". Central Statistical Bureau of Latvia. 2 April 2012. http://www.csb.gov.lv/en/statistikas-temas/population-census-2011-key-indicators-33613.html. Retrieved 2 June 2012. ^ a b c d "Latvia". International Monetary Fund. http://www.imf.org/external/pubs/ft/weo/2012/02/weodata/weorept.aspx?sy=2009&ey=2012&scsm=1&ssd=1&sort=country&ds=.&br=1&pr1.x=74&pr1.y=16&c=941&s=NGDPD%2CNGDPDPC%2CPPPGDP%2CPPPPC%2CLP&grp=0&a==. Retrieved 2012-10-26. ^ a b "Human Development Index Report 2011". United Nations. 2011. http://hdr.undp.org/en/statistics/. Retrieved 2 November 2011. ^ a b c d "Latvia". CIA. https://www.cia.gov/library/publications/the-world-factbook/geos/lg.html. Retrieved 2008-12-15. ^ a b "Latvia in Brief". Latvian Institute. 2011. http://www.li.lv/index.php?option=com_content&task=view&id=12&Itemid=1060. Retrieved 5 November 2011. ^ "Estonia at a glance". Estonia.eu. 2011. http://estonia.eu/about-estonia/country/estonia-at-a-glance.html. Retrieved 5 November 2011. 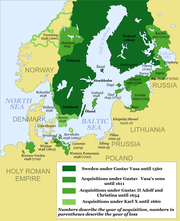 ^ "Council of the Baltic Sea States". Ministry of Foreign Affairs of Latvia. 2011. http://www.mfa.gov.lv/en/policy/4595/CBSS/. Retrieved 5 November 2011. ^ "Cooperation among the Baltic States". Ministry of Foreign Affairs of Latvia. 2011. http://www.mfa.gov.lv/en/policy/4595/cooperation/. Retrieved 5 November 2011. ^ "Cooperation of Baltic and Nordic States". Ministry of Foreign Affairs of Latvia. 2011. http://www.mfa.gov.lv/en/eu/BalticSeaRegion/NordicStates/. Retrieved 5 November 2011. ^ "The Nordic Council of Ministers' Office in Latvia". The Nordic Council of Ministers' Office. 2011. http://www.norden.lv/en/main. Retrieved 5 November 2011. ^ Peach, Gary (2010-03-11). "2009 worst year on record for Latvia, Estonia". BusinessWeek. http://www.businessweek.com/ap/financialnews/D9ECFF2G0.htm. Retrieved 2010-06-06. ^ "Report for Selected Countries and Subjects". Imf.org. 2006-09-14. http://www.imf.org/external/pubs/ft/weo/2009/02/weodata/weorept.aspx?pr.x=59&pr.y=12&sy=2007&ey=2014&scsm=1&ssd=1&sort=country&ds=.&br=1&c=941&s=NGDP_RPCH&grp=0&a=. Retrieved 2010-06-06. ^ "Baltic thaw, Aegean freeze". The Economist. 2010-02-25. http://www.economist.com/node/15581056. Retrieved 5 November 2011. ^ "Euro area and EU27 GDP down by 0.3". Eurostat. 2012. http://epp.eurostat.ec.europa.eu/cache/ITY_PUBLIC/2-15022012-AP/EN/2-15022012-AP-EN.PDF. Retrieved 15 February 2012. ^ "Latvia in Brief". Latvian Institute. 2012. http://latinst.lv/wp-content/uploads/2012/01/Latvia_in_brief.pdf. Retrieved 12 May 2011. ^ "Data: 3000 BC to 1500 BC". The European Ethnohistory Database. The Ethnohistory Project. http://life.bio.sunysb.edu/ee/msr/Ethno/dategen1.html. Retrieved 2006-08-06. ^ "Data: Latvia". Kingdoms of Northern Europe – Latvia. The History Files. http://www.historyfiles.co.uk/KingListsEurope/EasternLatvia.htm. ^ a b c d e f "Latvian History, Lonely Planet". Lonelyplanet.com. http://www.lonelyplanet.com/latvia/history. Retrieved 2010-10-16. ^ "The Crusaders". City Paper. 2006-03-22. http://www.balticsworldwide.com/the-crusaders/. Retrieved 2007-07-28. ^ J. T. Kotilaine (1999). "Riga's Trade With its Muscovite Hinterland in the Seventeenth Century". Journal of Baltic Studies 30 (2): 129–161. DOI:10.1080/01629779900000031. ^ V. Stanley Vardys (1987). "The Role of the Churches in the Maintenance of Regional and National Identity in the Baltic Republics". Journal of Baltic Studies 18 (3): 287–300. DOI:10.1080/01629778700000141. ^ Collector Coin Dedicated to 18th Century Riga. Bank of Latvia. ^ a b c d "Timeline: Latvia". BBC News. 2010-01-20. http://news.bbc.co.uk/2/hi/europe/country_profiles/1108059.stm. Retrieved 2010-02-05. ^ Nicholas Balabkins; Arnolds P. Aizsilnieks (1975). Entrepreneur in a small country: a case study against the background of the Latvian economy, 1919–1940. Exposition Press. pp. xiv, 143. ISBN 978-0-682-48158-8. http://books.google.com/books?id=PwaSAAAAIAAJ. Retrieved 19 February 2012. ^ Strods, Heinrihs; Kott, Matthew (2002). "The File on Operation 'Priboi': A Re-Assessment of the Mass Deportations of 1949". Journal of Baltic Studies 33 (1): 1–36. DOI:10.1080/01629770100000191. ^ a b "Agriculture – Key Indicators". Central Statistical Bureau Republic of Latvia. 28 April 2012. http://www.csb.gov.lv/en/statistikas-temas/agriculture-key-indicators-30725.html. Retrieved 17 May 2012. ^ a b "Forestry – Key Indicators". Central Statistical Bureau Republic of Latvia. 18 August 2011. http://www.csb.gov.lv/en/statistikas-temas/forestry-key-indicators-30729.html. Retrieved 17 May 2012. ^ a b c d "Geographical Data – Key Indicators". Central Statistical Bureau Republic of Latvia. 5 October 2011. http://www.csb.gov.lv/en/statistikas-temas/geographical-data-key-indicators-30773.html. Retrieved 17 May 2012. ^ a b "Latvia in brief". Latvian Institute. http://www.latvia.eu/content/latvia-brief. Retrieved 17 May 2012. ^ a b "Latvia in crosscut". Liepājas Universitāte. http://www.liepu.lv/lv/404/latvia-and-liepaja-. ^ "Latvia". Global Water Partnership. http://www.gwp.org/en/About-GWP/Country-Water-Partnerships/Latvia/. ^ "Latvia in brief". RPIVA. http://www.rpiva.lv/index.php?language=en&mh=struktura. ^ "The climate and weather conditions". Latvia.travel. http://www.latvia.travel/en/climate-and-weather-conditions. Retrieved 17 May 2012. ^ Latvijas ģeogrāfijas atlants. Rīga: Jāņa sēta. 2004. pp. 13. ISBN 9984073637. ^ a b c d e f g "Nature and Environment in Latvia". Latvian Institute. 2002. http://www.latvia.eu/content/nature-and-environment-latvia. Retrieved 17 May 2012. ^ "Forests cover around 40% of the EU27 land area". Eurostat. 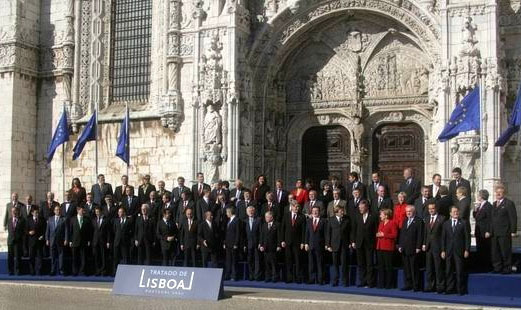 15 June 2011. http://epp.eurostat.ec.europa.eu/cache/ITY_PUBLIC/5-15062011-BP/EN/5-15062011-BP-EN.PDF. Retrieved 17 May 2012. ^ "Protected areas". Nature Conservation Agency Republic of Latvia. http://www.daba.gov.lv/public/eng/protected_areas/. Retrieved 17 May 2012. ^ "2012 Environmental Performance Index (EPI)". Yale University and Columbia University in collaboration with The World Economic Forum and European Commission. http://epi.yale.edu/epi2012/rankings. Retrieved 17 May 2012. ^ "List of species". Nature of Latvia. http://latvijas.daba.lv/scripts/db/saraksti/saraksti.cgi?l=en&s=en. Retrieved 2007-03-07. ^ "National Symbols of Latvia". Latvian Institute. http://www.latvia.eu/content/national-symbols-latvia. Retrieved 17 May 2012. ^ "Diplomatic and Consular Representations". Ministry of Foreign Affairs Republic of Latvia. http://www.am.gov.lv/en/mission/. Retrieved 13 May 2012. ^ "Foreign policy". Ministry of Foreign Affairs Republic of Latvia. http://www.mfa.gov.lv/en/policy/. Retrieved 13 May 2012. ^ "A foreign policy based on co-operation and constructive engagement". Latvian Institute. http://www.latvia.eu/content/latvia-today-keystone-baltic. Retrieved 13 May 2012. ^ "Background Note: Latvia". U.S. Department of State. 18 November 2011. http://www.state.gov/r/pa/ei/bgn/5378.htm#foreign. Retrieved 13 May 2012. ^ "Estonian Chairmanship of the Baltic Council of Ministers in 2011". Estonian Ministry of Foreign Affairs. 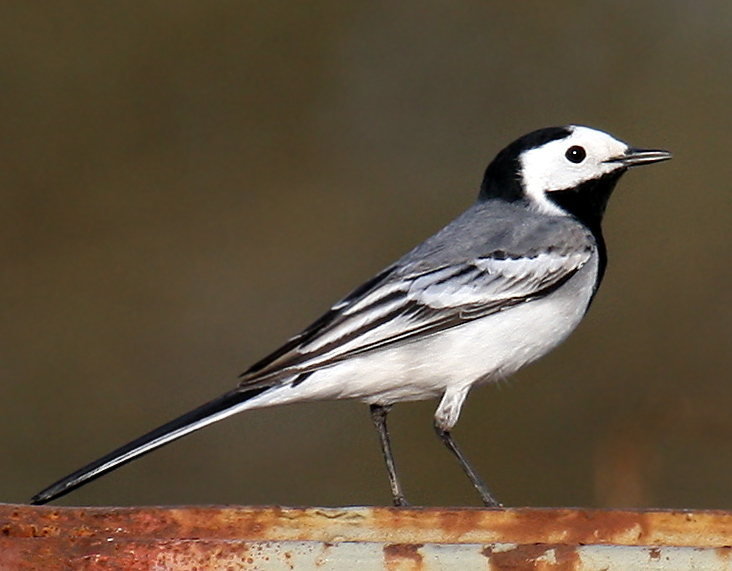 http://www.vm.ee/?q=en/node/4096. Retrieved 13 May 2012. ^ a b "Co-operation of Baltic and Nordic States". Ministry of Foreign Affairs Republic of Latvia. http://www.mfa.gov.lv/en/eu/BalticSeaRegion/NordicStates. Retrieved 13 May 2012. ^ "About Nordplus". Nordic Council of Ministers. http://www.nordplusonline.org/eng/nordplus/about_nordplus. Retrieved 13 May 2012. ^ "Enhanced Partnership in Northern Europe (e-PINE)". U.S. Department of State. http://www.state.gov/p/eur/rt/epine/. Retrieved 13 May 2012. ^ "In 2013, the "Northern Future Forum" will be held in Rīga". The Cabinet of Ministers Republic of Latvia. 9 February 2012. http://www.mk.gov.lv/en/aktuali/zinas/2012/1/020212pm03/. Retrieved 13 May 2012. ^ "About Rīga Conference". Rīga Conference. http://www.rigaconference.lv/. Retrieved 13 May 2012. ^ a b c "2008 Human Rights Report: Latvia". United States Department of State. 2009-02-25. http://www.state.gov/j/drl/rls/hrrpt/2008/eur/119087.htm. Retrieved 2009-06-09. ^ "Freedom in the World – Latvia (2008)". Freedom House. 2008. http://web.archive.org/web/20110515152102/http://www.freedomhouse.org/inc/content/pubs/fiw/inc_country_detail.cfm?country=7429&year=2008&page=0&view=mof&pf. Retrieved 2009-06-06. ^ "The Economist Intelligence Unit’s Index of Democracy 2008". The Economist. 2008. Archived from the original on 2008-12-14. http://web.archive.org/web/20081214053945/http://a330.g.akamai.net/7/330/25828/20081021185552/graphics.eiu.com/PDF/Democracy%20Index%202008.pdf. Retrieved 2009-06-05. ^ "Press Freedom Index 2010". Reporters Without Borders. 2010. http://en.rsf.org/press-freedom-index-2010,1034.html. Retrieved 2011-03-03. ^ "The 2007 International Privacy Ranking". Privacy International. 2007. http://www.privacyinternational.org/. Retrieved 2009-06-05. ^ "Statistics of the Human Development Report". United Nations Development Programme. 2008. http://hdr.undp.org/en/statistics/. Retrieved 2009-06-05. ^ "Country Report 2008 Edition". Freedom House. 2008. http://web.archive.org/web/20110624033519/http://www.freedomhouse.org/template.cfm?page=47&nit=457&year=2008. Retrieved 2009-06-06. ^ "Amnesty International Report 2009". Amnesty International. 2009. http://report2009.amnesty.org/en/regions/europe-central-asia/latvia. Retrieved 2009-06-08. ^ "Latvia: Investigate Attacks on Gay Activists". Human rights watch. 2006. http://www.hrw.org/en/news/2006/07/25/latvia-investigate-attacks-gay-activists. Retrieved 2009-06-08. ^ a b "Participation in International operations". Ministry of Foreign Affairs Republic of Latvia. http://www.mfa.gov.lv/en/security/Directions/InternationalOperations/. Retrieved 12 May 2012. ^ a b "Previous operations" (in Latvian). Latvian National Armed Forces. http://www.mil.lv/Operacijas/Ieprieksejas_operacijas.aspx. Retrieved 12 May 2012. ^ "Latvia and NATO". Ministry of National Defence Republic of Latvia. 2011. http://www.mod.gov.lv/en/NATO.aspx. Retrieved 12 May 2012. ^ "US-led coalition forces operation in OIF (Operation Iraqi Freedom)" (in Latvian). Latvian National Armed Forces. http://www.mil.lv/Operacijas/Ieprieksejas_operacijas/Citas_operacijas/OIF.aspx. Retrieved 12 May 2012. ^ "Other operations" (in Latvian). Latvian National Armed Forces. http://www.mil.lv/Operacijas/Ieprieksejas_operacijas/Citas_operacijas.aspx. Retrieved 12 May 2012. ^ "EU Battlegroup Offers and Commitments". Council of the European Union. 26 September 2012. http://www.parlament.gv.at/PAKT/EU/XXIV/EU/09/23/EU_92315/imfname_10376183.pdf. Retrieved 25 November 2012. ^ "Dombrovskis and US Ambassador Garber visit Riga Airport to inspect cargo plane to Afghanistan". The Baltic Course. 2012. http://www.baltic-course.com/eng/transport/?doc=56833. Retrieved 12 May 2012. ^ "One year on: ISAF’s trans-European supply routes are a success". NATO. 2011. http://www.nato.int/cps/en/SID-911EB74B-3555D8D2/natolive/news_74763.htm?selectedLocale=en. Retrieved 12 May 2012. ^ "NATO opens new communication lines to Afghanistan". NATO. 2010. http://www.nato.int/cps/en/SID-2C1657C8-A07AD24F/natolive/news_64397.htm?. Retrieved 12 May 2012. ^ Gerard O’Dwyer (13 September 2012). "Nordic Military Alliance With Latvia in Afghanistan". DefenseNews. http://www.defensenews.com/article/20120913/DEFREG01/309130008/Nordic-Military-Alliance-Latvia-Afghanistan. Retrieved 25 November 2012. ^ "Fallen soldiers" (in Latvian). Latvian National Armed Forces. http://www.mil.lv/Operacijas/Kritusie_karaviri.aspx. Retrieved 12 May 2012. ^ "Background Note: Latvia". U.S. Department of State. 18 November 2011. http://www.state.gov/r/pa/ei/bgn/5378.htm. Retrieved 12 May 2012. ^ "Baltic Defence Co-operation". Estonian Ministry of Foreign Affairs. 2002. http://www.vm.ee/?q=en/node/4105. Retrieved 28 April 2012. ^ "Baltic Defence Ministers announced new defence cooperation initiatives". Ministry of National Defence Republic of Lithuania. 2011. http://www.kam.lt/en/news_1098/news_archives/news_archive_2011/news_archive_2011_-_12/baltic_defence_ministers_announced_new_defence_cooperation_initiatives.html. Retrieved 28 April 2012. ^ "Nordic Countries Invite Baltics to Join Defence Co-operation Framework". Estonian Ministry of Foreign Affairs. 2011. http://www.vm.ee/?q=en/node/10686. Retrieved 28 April 2012. ^ "Joint Baltic Military Staff to Be Established". Estonian Public Broadcasting. 9 November 2012. http://news.err.ee/8140850c-b0bb-408b-96c6-7641b1bbfd10. Retrieved 25 November 2012. ^ "Growth rate of real GDP per capita". Eurostat. http://epp.eurostat.ec.europa.eu/portal/page?_pageid=1996,39140985&_dad=portal&_schema=PORTAL&screen=detailref&language=en&product=sdi_ed&root=sdi_ed/sdi_ed/sdi_ed1000. Retrieved 2007-07-28. ^ Eglitis, Aaron (2009-05-11). "Latvian GDP Shrank 18% in First Quarter, EU’s Biggest Fall –". Bloomberg.com. http://www.bloomberg.com/apps/news?pid=newsarchive&sid=ao7qqF0UESqc. Retrieved 2010-10-16. ^ "Latvian economy in rapid decline". BBC News. 2009-05-11. http://news.bbc.co.uk/2/hi/business/8043972.stm. Retrieved 2010-04-04. ^ Pop, Valentina (15 September 2011). "Latvia aiming to join eurozone in 2014". EU Observer. http://euobserver.com/19/113635. Retrieved 15 September 2011. ^ "Statistical Office of the European Commission (Eurostat), Monthly Bulletin: Table in chapter 09, section 01". Sdw.ecb.europa.eu. 2010-10-01. http://sdw.ecb.europa.eu/quickview.do?SERIES_KEY=132.STS.M.lv.S.UNEH.RTT000.4.000. Retrieved 2010-10-16. ^ "Eurostat – Tables, Graphs and Maps Interface (TGM) table". Epp.eurostat.ec.europa.eu. http://epp.eurostat.ec.europa.eu/tgm/table.do?tab=table&language=en&pcode=teilm020&tableSelection=1&plugin=1. Retrieved 2010-08-12. ^ Krugman, Paul (2008-12-15). "European Crass Warfare". New York Times. http://www.nytimes.com/2008/12/15/opinion/15krugman.html. Retrieved 2008-12-15. ^ Toomas Hõbemägi. "Baltic Business News, 8 February 2010". Bbn.ee. http://www.bbn.ee/article/2010/02/08/Moody_s_Latvian_economy_is_stabilizing. Retrieved 2010-10-16. ^ Public Information Notice (PIN) No. 12/76 by IMF. "IMF Executive Board Concludes First Post-Program Monitoring Discussions with the Republic of Latvia, July 16, 2012". imf.org. http://www.imf.org/external/np/sec/pn/2012/pn1276.htm. Retrieved 2012-07-18. ^ Population Census 2011 – Key Indicators. Csb.gov.lv. Retrieved on 2012-02-19. ^ "About Latvia". Latvian Academy of Culture. http://www.lka.edu.lv/modules.php?op=modload&name=News&file=index&topic=68. Retrieved 2007-07-28. ^ "Referendum on the Draft Law "Amendments to the Constitution of the Republic of Latvia"". Central Election Commission of Latvia. 2012. http://web.cvk.lv/pub/public/28361.html/. Retrieved 2 May 2012. ^ "Results of the referendum on the Draft Law "Amendments to the Constitution of the Republic of Latvia"" (in Latvian). Central Election Commission of Latvia. 2012. http://www.tn2012.cvk.lv/. Retrieved 2 May 2012. ^ a b c d e "Tieslietu ministrijā iesniegtie reliģisko organizāciju pārskati par darbību 2011. gadā" (in Latvian). http://www.tm.gov.lv/lv/labumi/TM.docx. Retrieved 2012-07-25. ^ Eunice K. Y. Or (2004-09-23). "Trust in Religious Institutions does not convey to Church Attendance". Christian Today. http://www.christiantoday.com/article/trust.in.religious.institutions.does.not.convey.to.church.attendance/1462.htm. Retrieved 2007-07-28. ^ "Latvia – SOCIETY". Mongabay.com. 1987-03-18. http://www.mongabay.com/reference/country_studies/latvia/SOCIETY.html. Retrieved 2010-08-12. ^ "Statistics of approved parishes in Latvia" (in Latvian). Reliģiju Enciklopēdija. The Latvian Bible Society. 2004-01-01. http://www.bibelesbiedriba.lv/religiju-enciklopedija/statistika.html. Retrieved 2007-03-07. ^ "Riga Polytechnical Institute Home Page". Rtu.lv. http://www.rtu.lv. Retrieved 2010-10-16. ^ "Latvijas Statistika". Csb.gov.lv. 2010-05-17. http://www.csb.gov.lv/csp/content/?lng=lv&cat=2300. Retrieved 2010-06-06. ^ "Latvia's Healthcare System is Funded by General Taxation and All Latvians and Foreign Residents Are Guaranteed Medical Care | Business Wire | Find Articles at BNET". Findarticles.com. 2005-11-18. http://findarticles.com/p/articles/mi_m0EIN/is_2005_Nov_18/ai_n15860135/. Retrieved 2010-02-05. ^ The Baltic Course – Балтийский курс (2008-11-14). "Latvia has worst health care system in Europe :: The Baltic Course | Baltic States news & analytics". The Baltic Course. http://www.baltic-course.com/eng/analytics/?doc=7137. Retrieved 2010-02-05. ^ Jolly, David (2009-06-18). "Latvian Health Official Resigns Over Cuts". The New York Times. http://www.nytimes.com/2009/06/18/business/global/18lat.html?ref=business. Retrieved 2010-04-04. ^ "The basic indicators of health care, at the end of the year". Csb.gov.lv. 2010-01-22. Archived from the original on 2007-12-16. http://web.archive.org/web/20071216125055/http://www.csb.gov.lv/csp/content/?cat=2310. Retrieved 2010-02-05. ^ "The Baltic States and their health systems – From Soviet to EU". European-Hospital. http://www.european-hospital.com/en/article/29-The_Baltic_States_and_their_health_systems-From_Soviet_to_EU.html. Retrieved 2010-02-05. ^ David Hayhurst. "Fighting Corruption in Health Care Services". Worldbank.org. Archived from the original on 2011-06-29. http://web.archive.org/web/20110629023653/http://www.worldbank.org/html/prddr/trans/aprmayjun03/pgs26-27.htm. Retrieved 2010-02-05. ^ "Incidence of alcoholism, narcotic and psychotropic substances habit". Csb.gov.lv. 2010-01-22. Archived from the original on 2007-12-16. http://web.archive.org/web/20071216125214/http://www.csb.gov.lv/csp/content/?cat=2316. Retrieved 2010-02-05. ^ "2010 Update for the MDG database:Adolescent birth rate". www.un.org. 2010-09-05. http://www.un.org/esa/population/publications/2010_MDGDatabase/2010_Update_MDG_ABR.xls. Retrieved 2011-02-06. ^ "WHO | Country reports and charts available". Who.int. 2009-12-07. http://www.who.int/mental_health/prevention/suicide/country_reports/en/index.html. Retrieved 2010-02-05. ^ "Welcome to Latvia – Folk Songs". Li.lv. 2006-05-01. http://www.li.lv/index.php?option=com_content&task=view&id=40&Itemid=124. Retrieved 2010-10-16. ^ "Latvianart.org, "Historical Background"". http://latvianart.org/historical.html. ^ "Household Download Index". http://www.netindex.com/. Retrieved 15 July 2012. Lumans, Valdis O. (2006). Latvia in World War II. Fordham University Press. ISBN 0-8232-2627-1. http://books.google.com/books?id=IPv1gjLhtZ4C&printsec=frontcover. These names accuse: nominal list of Latvians deported to Soviet Russia in 1940–41 with supplementary list (2nd ed.). Stockholm: Latvian National Foundation in co-operation with the World Federation and Free Latvians. 1982. OCLC 10403023. http://latvians.com/en/Reading/TheseNamesAccuse/ThNA-00-OurFamilies.php. Retrieved 2007-07-30. D'Amato, Giuseppe (2004). Travel to the Baltic Hansa – The European Union and its enlargement to the East (Book in Italian: Viaggio nell’Hansa baltica – L’Unione europea e l’allargamento ad Est). Milano: Greco&Greco editori. ISBN 88-7980-355-7. http://www.europarussia.com/books/viaggio_nellhansa_baltica/travel-to-the-baltic-hansa. Lehti, Marko; and David J. Smith (eds.) (2003). Post-Cold War Identity Politics – Northern and Baltic Experiences. London/Portland: Frank Cass Publishers. ISBN 0-7146-8351-5. Williams, Nicola; Debra Herrmann, and Cathryn Kemp (2003). Estonia, Latvia, and Lithuania (3rd ed.). London: Lonely Planet. ISBN 1-74059-132-1. Hiden, John; and Patrick Salmon (1991). The Baltic Nations and Europe: Estonia, Latvia, and Lithuania in the Twentieth Century. London: Longman. ISBN 0-582-08246-3. Commercio, Michele E. (2010). Russian Minority Politics in Post-Soviet Latvia and Kyrgyzstan – The Transformative Power of Informal Networks. Philadelphia: University of Pennsylvania Press. ISBN 978-0-8122-4221-8. This page uses content from the English language Wikipedia. The original content was at Latvia. The list of authors can be seen in the page history. As with this Familypedia wiki, the content of Wikipedia is available under the Creative Commons License.